The quick and easy pitch for OPEN GRAVE is MEMENTO meets 28 DAYS LATER. Except, like the characters in the film itself, you won't realize that right away. So, I guess, SPOILER ALERT? Whatever, the description on Amazon Prime's instant streaming service says it's a zombie movie, so it was hard to not know that fact going in. 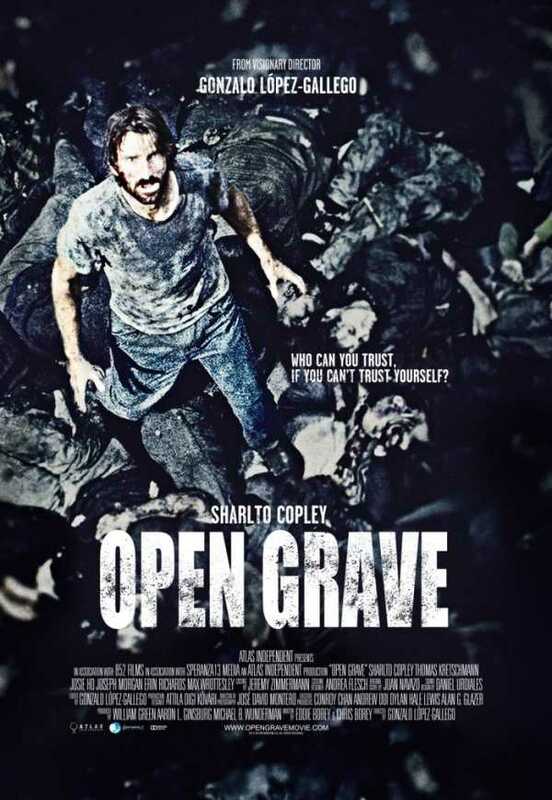 The film begins with amnesiac John (Sharlto Copley) waking up in a pit filled with dead bodies. A woman throws him a rope so he can climb out, and he eventually makes his way to a house where he meets his unnamed savior (Josie Ho) as well as 4 other memory challenged individuals: Lukas (Thomas Kretschmann), Nathan (Joseph Morgan), Sharon (Erin Richards) and Michael (Max Wrottesley). They know their names thanks to finding their IDs, but that's about it. And given the horrifying circumstances in which they find themselves, what with all the dead bodies around and such, no one is particularly trusting of their mates. Only the woman who saved John seems to know what's going on, but she doesn't speak or write English. Slowly the characters begin to piece events together, but their interpretations aren't always accurate. Making matters worse, it soon becomes clear that there are people outside of this small group who are afflicted with some sort of homicidal mania. They also learn that something of importance is due to take place on the 18th, which is the very next day, but exactly what is uncertain. It's a tense and engrossing setup, and director Gonzalo López-Gallego plays it for all it's worth. Fortunately the script by Chris Borey and Eddie Borey is more than just a puzzle box, giving us well written characters who connect emotionally even when we're not sure if we should trust them. The zombies (or "infected", given that the ravenous hordes appear to be alive rather than undead) don't make much of a showing until the final act, and even then they aren't nearly the overwhelming horde one is used to in films like these. But that's fine. They serve their purpose in the film. The real fun is in slowly learning how the amnesiacs are related and how they got in their present position. Whether any of them will survive to make use of the information as the movie doles it out is up for grabs. As burned out on zombie films as I am, I'm always happy to watch a good one. This is a good one. Figuring out the mystery along with the characters is both fun and emotionally involving. 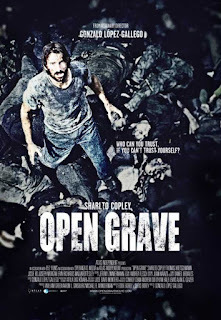 Action and gore are fairly toned down for the genre, as is the socio-political commentary that often accompanies films about the undead, but OPEN GRAVE has morbid, mysterious, and emotional charms of its own. 3 out of 4 stars.